Kimberley Morrison is a second year student studying at James Cook University. She joins many other students and aims to receive a Bachelor of Creative Industries. Although she began the bachelor with a major in Visual Arts, Kimberley discovered her passion for design and is now majoring in Media Design. 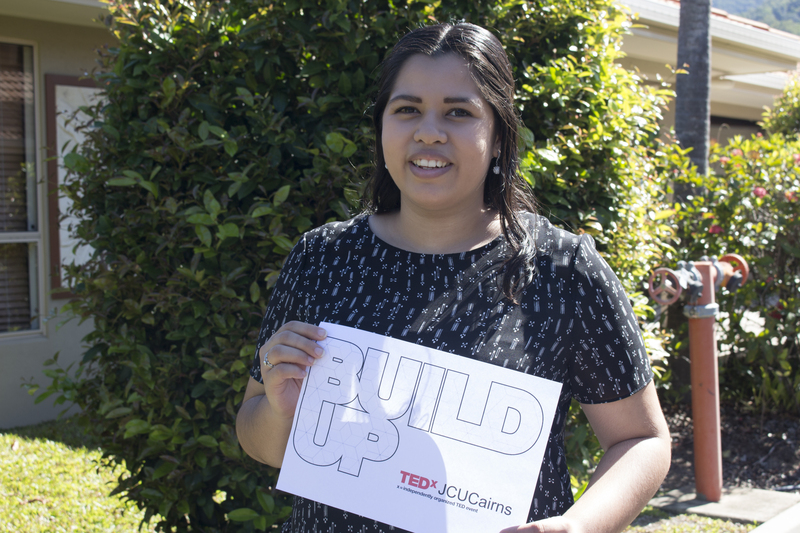 Recently, students in a class called CV2420 – Media Designs and Concepts were given the opportunity to design the branding materials for this year’s TEDxJCUCairns event. The design that Kimberley submitted appealed to the organiser and she was able to meet with Cameron LeBherz, the graphic designer at James Cook University in Cairns. Kimberley had two mentoring sessions with Cameron LeBherz, in which they discussed how to use her designs to construct a logo for the event’s theme, Build Up. Jennifer McHugh, who is the organiser of this year’s event, suggested that she wanted to combine lettering and graphical elements. Kimberley’s design was transformed into a successful logo within these two meetings and she is very happy with the final product.